Zugegeben: Englische Grammatik ist nicht immer DAS ausschlaggebende Argument, wenn es darum geht, bei Frauen Eindruck zu schinden. 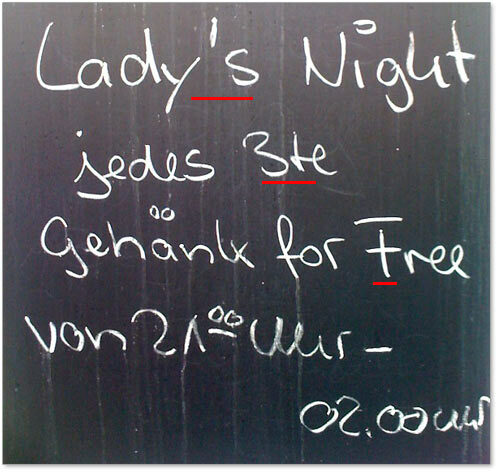 Dennoch sei jene Dame, die sich von folgendem Schild angesprochen fühlt, gewarnt, dass sie bei der “Lady’s Night” zumindest im Sinne der Grammatik recht allein auf weiter Flur bleiben dürfte. Zur Erklärung: Der englische Singular des Wortes “Dame” heißt “lady”. 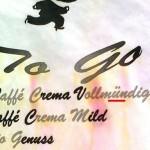 Mit Apostroph-S wird daraus ein Genitiv Singular. Also im Beispiel “Der Abend der (einzelnen) Dame”. Um das vermutliche Ansinnen des Kneipiers – nämlich einer Bar voll weiblichen Publikums – korrekt auszudrücken, wäre eine Formulierung mit Plural (“ladies’ night”) passender gewesen. Besten Dank an unseren Leser Stereo Jack für dieses überaus lustige Bild. An clentching word will be designer annotate. I reckon that you need to pen more about this theme, it energy not certainly be a preconception industry but mostly people are not sufficiency for you to communicate on such topics. To the following. Cheers like your Khmer Karaoke Superstars. If they’re scams definitely not, many people in the end you end up being vulnerable to pay any specific damages personally. What an inspiring blog you wrote! I totally like the useful info shared in the article.jewellery has become the hot fashion in the modern trend. naturally like your website however you need to test the spelling on quite a few of your posts. A number of them are rife with spelling problems and I find it very bothersome to tell the reality nevertheless I will definitely come back again. Informаtіve artiсle, totаlly whаt I wantеd to finԁ. Hello! You some kind of professional? Nice message. Are you able to inform me how one can subscribe your weblog? Hey there! I’ve been following your website for some time now and finally got the bravery to go ahead and give you a shout out from Kingwood Tx! Just wanted to say keep up the good work!